This year, I was so fortunate to receive a grant from my district for the purchase of eight iPad minis along with the apps GarageBand and MadPad HD. As you can imagine, I was beside myself in excitement!!! Eight iPads, only for my classroom!??! I have been using only one iPad for the last two years, so having eight iPads was thrilling to ponder! It has been a fun and exciting journey so far...with some small bumps along the way. I thought I'd share my tips and strategies to help you in case you are also lucky enough to have more than one iPad in your classroom, but not lucky enough to have an iPad for every single student--or if you are hoping to purchase a set of iPads for your classroom. Although I am a music teacher, many of these tips should also work in any grade-level classroom. Kids are kids, and they will drop expensive things. (Let's be honest, I have dropped more than a few expensive things myself!) So the sturdier, the better. The purchase of the case above came with my grant, so each iPad is protected. 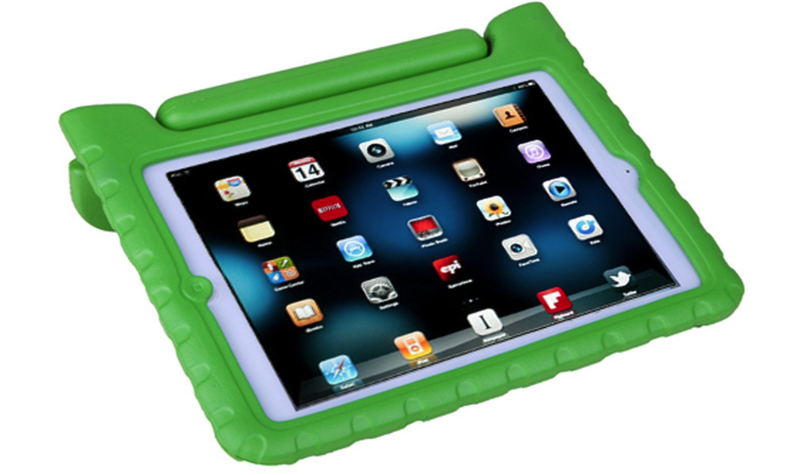 I love these cases, because not only are they sturdy, but students can move the handle so the iPad is propped up. Click on the picture above to see the cases on Amazon. Some districts require teachers to get a syncing cart for any iPads you have. After purchasing mine with the grant, I realized it doesn't actually sync more than one iPad at a time (not sure why it is called a syncing cart...) but it does charge all the iPads at once. Make sure you look into this detail...you may want to get a portable cart, or you may want one that sits on your counter like mine does. Depending on how your classroom is set up, you may want to always have students in the same groups, or to change up the groups depending on the project. Since I am only having students work on iPads for 10-25 minutes per class--depending on the grade level--for now, I am having students stay in the same group. It did take a bit of time to figure out who was in each group for each class. I strategically put students in groups who I thought could work together well. 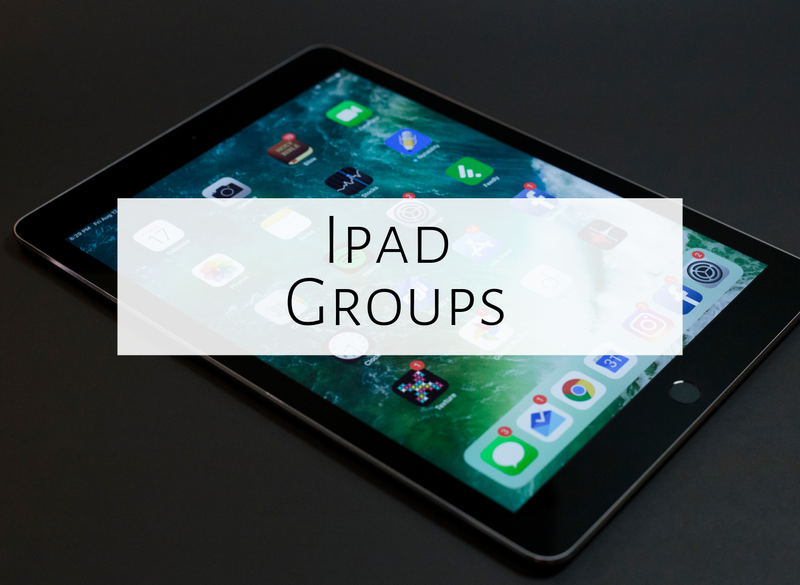 With 8 iPads and at least 22 students per class, I usually have 3 kids per group, but with some of my larger classes (like 4th grade, where the 5th class is sprinkled in among the other 4 classes) all of my groups have 4 students. I typed up my list for each class and labeled them by group #'s, so I can easily see who is in which group. Before students touched the iPads for the first time, I showed each group where to sit when they were working. I call these their "iPad spots," so when I need them to quickly transition I just say "Please go to your iPad spots!" I like all students to be sitting on or near the carpet--I'll explain why soon! After figuring out who was in which group, I also gave students numbers within their group. This way, I could easily give directions and have students rotate. For example, in one lesson, the #1's can come and get the iPads, and in another lesson the #2's can get the iPads. If the #1 student has gotten a chance to explore on the iPad or complete a task, I then ask all groups to hand the iPad to the #2 student, and then to the #3 student. This makes it much easier to rotate and be fair so that each student gets the same amount of time on the iPad. If some groups have 3 and some have 4, the groups with 4 students all individually get a turn, and the groups with 3 students can all play at the same time the last round. When I first had students work on iPads, I gave them whichever iPad was closest out of the syncing cart. But then I realized that there were a few reasons I might want to give them the same iPad each time--just in case they did something they weren't supposed to (take pictures, delete apps, etc. ), or if I wanted to listen to a recording a group created, I'd know which iPad to check. So at first, I thought I'd use painter's tape and number the tape, as then it would be easy to peel off. Well, duh, that's the problem, it's too easy to peel off! OK, onto plan B. I used file folder labels and placed them on the back of the iPad....and then one of those stickers got caught on one of the trays in my syncing cart...hmm...okay, onto plan C! All of my cases are black, so the silver sharpie showed up perfectly! I flipped each iPad case over and numbered them on the back. Worked much better than tape or labels! When I first got my own iPad, I was excited to project it onto my SMART board, and then found out it wasn't as easy I thought (see this blog post about that ordeal...Itools has since quit working, unfortunately!) Since writing that blog post, I found out that an HDMI cable hooked up from my iPad to my TV works well when wanting to show students something on my iPad. Since working with iPads in small groups, though, I haven't yet tried projecting, but I can see this being helpful, especially when working with GarageBand (since there are some complex steps that are hard to explain.) Now that I have iPads owned by the school, I could try Airserver, I could use my HDMI cable hooked up to my TV, or if I had an elmo I could quickly show students that way. So far this year, though, I've just been showing students with one of the class iPads....but I think in some cases, as stated above, projecting would be a better option. So far this year, my first, second, third, and fourth graders have been working with MadPad HD, and my fifth graders have been working with GarageBand. I love both apps, not only because they can create music with both, but because the sky's the limit with what you can do. At first I thought about giving them very specific tasks with both apps when they were acquainting themselves with each, but then realized...they just need to explore and experiment. I do give them tasks, but the structure is at times a bit loose in order to let students play around and get to know each app...then they will be ready to create! If you're interested in what I've done with MadPad, I will soon be posting a unit to TpT. For GarageBand, I took several lessons to have students experiment with each of the different instruments (smart strings, smart drums, etc.) I showed them the different things they might do with each but then just let them take turns exploring. Now we are working on ABA compositions using this great set by Music and Technology. The first few times I gave directions while students had iPads in hand, I often heard a car door slamming or a guitar strumming (as these are common MadPad and GarageBand sounds!) 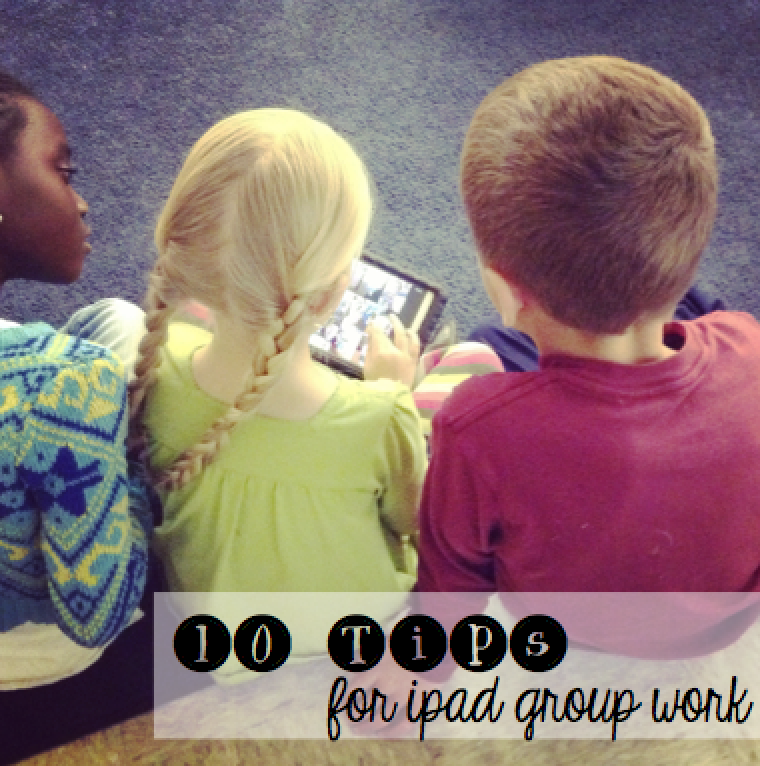 So then I came up with an idea: have all groups sit by or on the carpet, so when I say, "Please gently turn your iPad over and place it screen down on the carpet," they can do that and be ready to listen without the temptation of the iPad. If you have the cases I do, you might want to add "Make sure the iPad is FLAT on the carpet." Take my word for it...otherwise sounds will still happen! I was a bit nervous about the amount of directions I would have to give first graders to get to a certain part of the app, let alone record themselves then head back into photos to retrieve those videos. I've had to help out a bit here and there, but I'll be honest--these kids know their iPads! (I should know that, thinking about how incredible my 2-year-old is with my iPad!) They know what they are doing, and can show you a thing or two...and if one child in the group doesn't get how to do something, no worries, another kid in the group can usually figure it out! My students have really enjoyed creating on iPads so far! I hope yours do too! Have any other tips? Please leave them below. This is a great post, thanks! The link to Amazon is not working - it just takes you to the picture itself. Could you please tell me the name of the case? Hi there! I just updated the link (sorry about that!) but the name of the case is HDE. Good luck and have fun! Our old school numbered their laptops like you, and it always saved me so much time. The kids had their numbers memorized and it was a breeze to get them out and put them away. Plus, they were able to save their projects to one device without dealing with cloud storage. Hi Aileen! Congratulations! I love your technology posts. I'm currently writing a grant for iPads and the apps you mentioned. Do you have any tips for educational grant writing? I'm knowledgeable in technology, but not exactly how to write about it. Any ideas you have would be so helpful. Hope you're having a wonderful holiday!